The Prime Minister Hon. Peter O’Neill has committed to continue partnering with communities and districts who take the lead in providing better homes to improve lives of people and create stronger communities. PM O’Neill said this after committing K250,000 towards a community based project to build homes for families in the Waria Valley area of the Huon-Gulf District in Morobe province. The Morobe Rural Housing Project project is being coordinated by former Huon Gulf MP, Sasa Zibe, to help families in the district build better homes and improve the people’s lives. Prime Minister O’Neill was invited by the community to officially launch the project at the handover of the project’s operational plan manuals to fourteen Local Level Government Wards in the District on March 18. 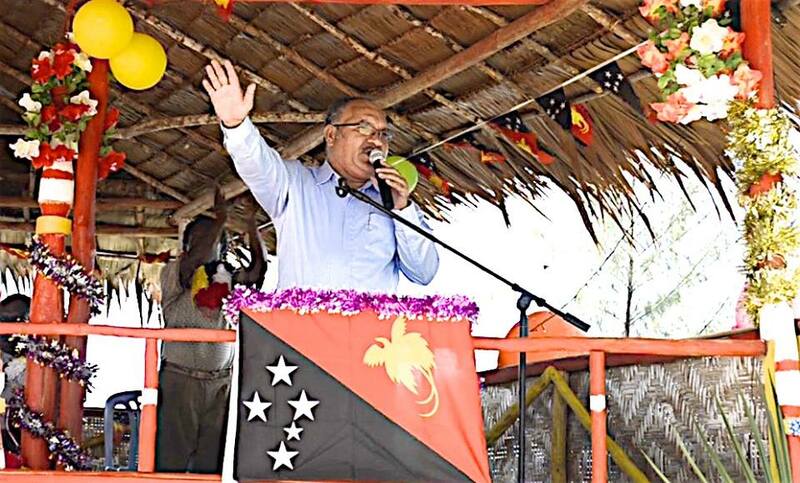 “Housing is a basic need for our people, and I commend your community and your Leader and former MP for Huon-Gulf Sasa Zibe, for taking a lead role,” the Prime Minister said. “I have know him since 2006 when he was an MP and Minister, as one of the best and strongest leaders of our country. “When we have better homes for our people we will have better and healthy communities. “That also applies to free and better healthcare, to which our Government is fully committed to providing. Prime Minister O’Neill told hundreds of people, who had gathered for the first time to witness a sitting Prime Minister visit their district, that the Government is committed to rural and community based projects. “We are directly funding 10 million Kina to every district in the nation through the District Services Improvement Program, and this is helping to improve people’s lives. “We are building infrastructure in our country because we want our people in rural areas and provinces to get benefits and services like concrete roads. The Prime Minister warned that in the coming months, people around the nation had a serious choice before them, to continue the growth and reform of the past five years, or to go backwards. “It is unlikely that a different Government will continue free education and healthcare, or housing programs and infrastructure programs. “We have changed Papua New Guinea by putting our people first and if our Government returns after the election we will continue with our core policies. “Our opponents might complain that free education is expensive, and it is costly, but it is worth it.